Free Bike Tune-Ups by Scarborough Cycles! Also, bring your old/unwanted bikes. We will make sure that they get re-purposed to enhance our programs! 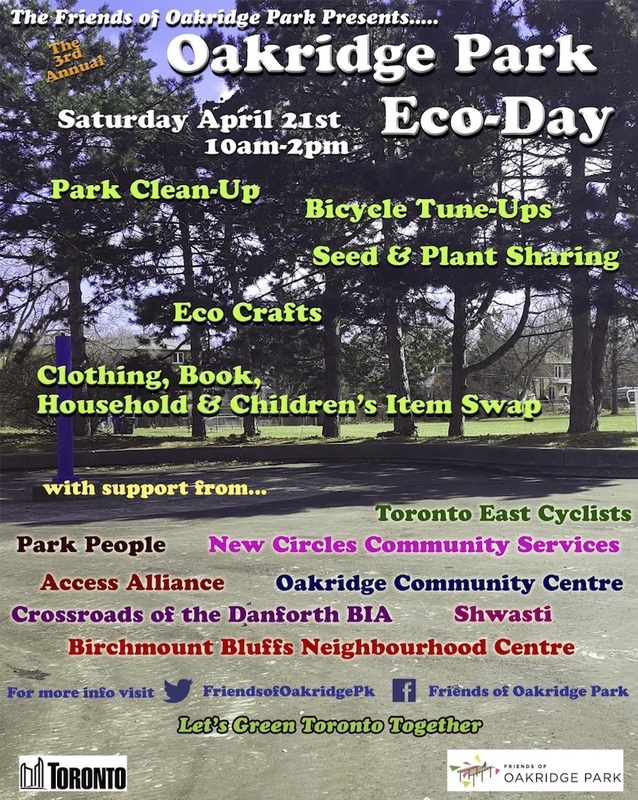 Join the Friends of Oakridge Park for our 3rd annual Eco-Day on Saturday April 21nd 2018. As part of Clean Toronto Together weekend, the community will clean Oakridge Park along with surrounding neighbourhood parks (including Prairie Drive Park, Madelaine Park, Kenworthy Park, Scotia Parkette and Lucy Tot Lot). The fun doesnt stop there. A number of other Spring Cleaning and Environmental activities are planned for the day. Get your ride ready for summer with a free bike tune up. Neighbours will be sharing plants and seeds. There will be Eco friendly crafts and stories to entertain the family. Participate in our clothing, book, household and childrens item swap. All gently used clothing not swapped will go to New Circles Community Services. All this happens between 10 am and 2 pm in Oakridge Park (where Danforth Avenue meets Danforth Road).